Aedes aegypti is known as a daytime biter. Description: Adults are approximately 0.15 to 0.25 in. with white scales on the thorax (top-side) that resemble a violin. Tarsal segments of the hind legs have white bottom bands that look like stripes. Abdomen is darkish brown to black, and may have white scales. Females are larger than males, have small palps tipped with white scales, and short hairs on antennae. Males have plumose (feather-like) antennae. Female mouthparts work for feeding on blood, whereas male mouthparts work for feeding on nectar. 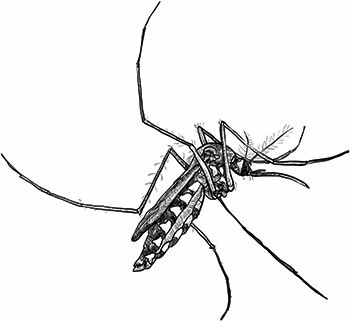 As typical with Aedes species, the tip of the abdomen ends in a point. 1) Sylvan: rural areas, such as tree holes. 2) Peridomestic: man-made areas, such as buckets. 3) Domestic: urban areas, plus in and around homes. Habitat: After a successful bloodmeal, females singly place 100 to 200 eggs per batch, up to five batches per female lifetime. During hours or days, and in more than one location, eggs are placed upon damp surfaces within areas that flood (tree holes and containers). Larvae develop through four instars. Breathing through siphons, larvae, or “wrigglers,” wiggle irregularly within water when disturbed. Pupae move and respond to stimulation. Nicknamed “tumblers,” pupae do not feed; they develop within two days. Taking in air to expand the abdomen, adults emerge headfirst by splitting the pupal case. Food: Adult females feed upon blood and nectar. Adult males feed upon nectar. Larvae feed upon small aquatic organisms, algae, and particles of plant and animal material. Range: Tropical, subtropical and some temperate climates. Unique behavior: Adult females prefer to bite during the day, indoors, and primarily bite humans. They usually approach from behind and tend to bite on the ankles and elbows. Significance: They are the primary mosquito vectors for Zika, chikungunya, dengue and other arboviruses.